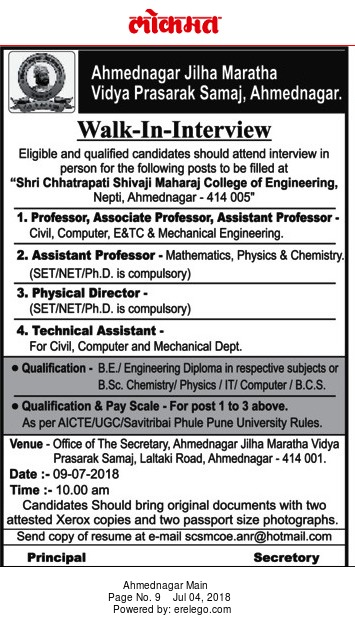 Ahmednagar Jilha Maratha Vidya Prasarak Samaj, Ahmednagar has advertised in the LOKMAT newspaper for recruitment of Teaching Faculty- Professor / Associate Professor / Assistant Professor Plus Non-Faculty jobs vacancies. Interested and eligible job aspirants are requested to walk-in on 09th July 2018. Check out further more details below. About College : Ahmednagar Jilha Maratha Vidya Prasarak Samaj is one of the oldest & pioneering society / trust which has been promoting education since 1918. The Late Chhatrapati Shahu Maharaj of Kolhapur not only inspired but also financially supported the starting of the society achat levitra. The progress started with the establishment Late Hutatma Karveer Chhatrapati Shivaji Maharaj Maratha Boarding in 1918. The Residential High School (earlier named as Tagore High School) was established in 1941. From this period onwards development started at a faster pace. How to Apply: Interested and eligible candidates are requested to attend the Walk-in interview along with all copies of certificates / testimonials and recent PP size photos to the walk-in address provided here. And also send copy of resume to following email address given below.